Disordered eating is becoming more and more common in women and men of all ages. Eating disorders can be caused by numerous factors including peer pressure, the stick thin portrayal of models in the media and the strong influence of the diet industry. Eating disorders are often associated with the more well-known anorexia nervosa, however, can appear in many different forms, some of which may not cause weight loss. 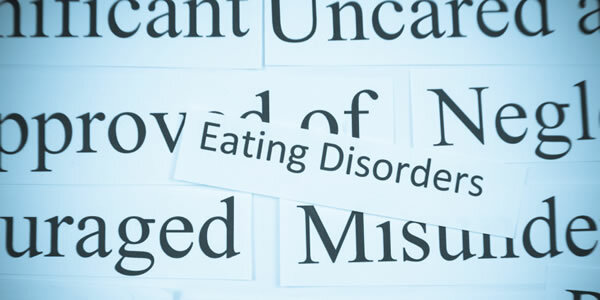 For this reason it is important to be aware of the different symptoms and characteristics that can occur in cases of disordered eating if you feel that someone close to you may be suffering from this type of condition. Many people with eating disorders are adept at concealing their condition from family and friends, so it can be extremely difficult to be sure if a person is suffering from a condition effecting their eating or not. If you suspect an eating disorder in someone close to you, here are some key characteristics to look for to help to make the decision as to whether medical intervention is necessary. It is often assumed that people suffering from an eating disorder will be obviously underweight or lose a large amount of weight in a short period, however, this is not always the case. In some cases, such as in those suffering from bulimia nervosa, there may be no obvious weight change. Having said this, the most obvious sign of an eating disorder is still probably rapid weight loss, particularly to an unhealthy level. Sufferers may also exhibit dizziness, may faint, always be cold and suffer from constant tiredness. Loss of menstruation is also common in women and girls, although this may not be an obvious warning sign to an outsider. Those suffering from bulimia may also have bad breathe, damaged teeth or knuckle callouses due to self-induced vomiting. Changes in a person’s moods, attitudes and emotional states can also signify an eating disorder. Those suffering often appear to be obsessed with food, how they look and what they weigh. They may also have mood swings, be stressed or anxious and commonly have low self-esteem. It is also common for eating disorder sufferers to see themselves differently from how they really look, usually meaning they see themselves as a lot larger than they actually are. Anorexia nervosa sufferers will commonly use food deprivation as a mode of self-punishment, whilst binge eaters may also use food as an escape from stress or other emotional issues. It is common for people with eating disorders to count calories, fast or avoid certain food groups that are considered ‘bad’, however, this behavior is not obvious all the time as many sufferers also chose to avoid situations which involve food and eating. Ongoing refusal to dine out or to attend events that involve eating may be a sign of an underlying condition, as may frequent trips to the bathroom during or after a meal. Wearing baggy clothes to hide changes in weight, excessive exercise, sudden dislike of foods, vomiting or laxative use, and obsessive rituals surrounding eating and food preparation may also be warning signs that something is amiss. What to do if you suspect someone close to you suffering from an eating disorder? Eating disorder sufferers are often extremely sensitive to comments about their weight, food intake or exercise regime, so it is important to use the right approach so as not to make the condition worse or suggest that you are not supportive of the person. Depending on your relationship with the person, it may be appropriate to talk to them about your concerns, or as an alternative to a member of their family or a close friend. However, it is important not to make the sufferer feel that they are being attacked by a group of people they are close to. If you feel the situation is beyond the stage where it can be discussed and talked through with the person, it is essential to seek professional help. Websites such as www.nationaleatingdisorders.org, can provide the information and resources to help you make the right decision when it comes to therapists. Doctors, physiologists, dieticians, and counselors can all be an important part of a team when it comes to treating an eating disorder and there are many approaches to dealing with the situation depending on the severity of the disorder and the willingness of the sufferer to change. Although friends and family can be an integral part in the healing process, most eating disorder sufferers will need some form of professional help to move past their condition, although there is no one approach to treating an eating disorder that is deemed more successful than others. In these cases it is often important for the sufferer to have the support of those close to them and feel that they can trust and talk to them, rather than that they are constantly trying to make them eat.